Product Description The Lab-Line P.A.C.E. (Programmed Anaerobic Controlled Environment) 6550 glove box combines an anaerobic incubation environment with user-friendly microprocessor control. The large 2.2cu.ft. inner chamber includes three interior electrical outlets and wire shelves. Fail-safe locking mechanism prevents inner door from being opened out of sequence. 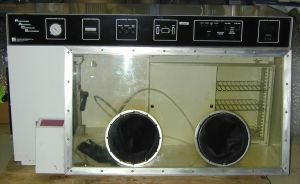 Glove ports in clear vinyl chamber front provide access to sealed working chamber. Critical positive pressure is automatically maintained; air bubble exhaust system relieves excess pressure. Automatic interchange mode features three microprocessor-controlled sequential purges: 2 with nitrogen and 1 with mixed gasses. Audible alarm notifies user if chamber anaerobic integrity is jeopardized.